Bearbrass Asylum Orchestra: We Won! We are proud to announce that our film clip, Welcome won the Judges' Choice Award - Documentary in the NOVA Employment Focus On Ability Short Film Competition. Our fabulous director Carl Thompson flew to Sydney for the gala award ceremony and spent the night schmoozing on our behalf. A big thank you to everyone who helped us make the film and to all of you who voted for us and shared it with your friends. If you haven't seen our it yet you can check us out at Focus on Ability. 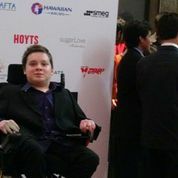 Our director, Carl Thompson, on the red carpet.